We all know the feeling: In the game of life, why am I the only one who doesn't know how to play? But now, help is at hand, because this wonderful little book will teach you the rules so that you can conquer life's challenges and manage its unpredictable ups and downs. For one of her workshops several years ago, Chérie Carter-Scott, a corporate trainer and consultant, composed a list of basic truths about life, which she named "The Ten Rules for Being Human." Right away, the Rules resonated with her clients, who photocopied and passed the list to friends and relatives. Within months, Chérie's Rules were in thousands of homes all over the country, and eventually, they were published in Chicken Soup for the Soul and have also appeared in Ann Landers' column. Although there's no formula to help you win the game of life, Chérie's Rules convey a universal wisdom that, once understood and embraced, can contribute to meaningful relationships with ourselves and others, at work and in the home. Chicken Soup for the Soul, they instantly became a favorite section of that wildly successful book. Chérie Carter-Scott, Ph.D., author of the bestselling Negaholics and If Love Is a Game, These Are the Rules, is a corporate trainer and management consultant. As chairperson of the Motivation Management Service Institute, she has worked with over 200,000 people worldwide, leading seminars on self-esteem, communication and leadership skills, and team building. Chérie lives in Nevada with her husband and daughter. "If Life Is a Game, These Are the Rules is a template for living. Everyone needs to read these words of wisdom. It's 'simple' yet important stuff." 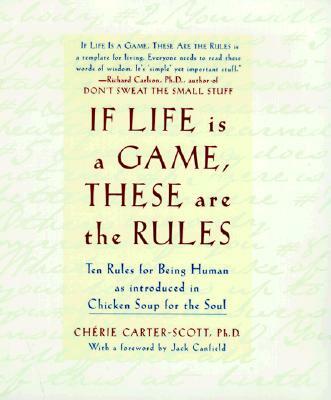 "How wonderful it would be if we were all given Chérie Carter-Scott's ten rules the day we were born. Chérie has been teaching these rules for over twenty years. In her seminars, these rules have resonated with thousands of people. If Life Is a Game, These Are the Rules are universal truths that all of us can learn to live happier lives that are full of self-acceptance, understanding, love, success, and the inner knowing that we're all in this game together, on the same team. The door to a satisfying life lies within each of us, and Chérie's eternal inspiring message provides the key." "The Ten Rules for Being Human are entertaining and fun--but more than that, they're TRUE." "If Life Is a Game, These Are the Rules will free you to wake up to your no-limit life."